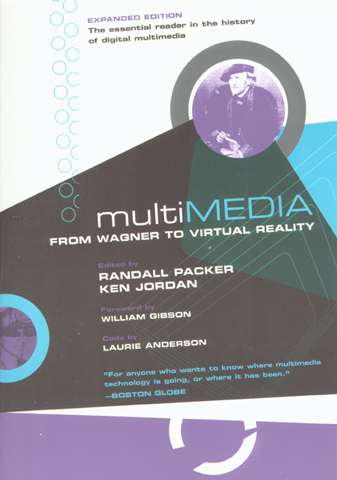 Tracing the fertile series of collaborations between arts and sciences throughout the twentieth century, Randall Packer and Ken Jordan present the often overlooked history behind multimedia—the interfaces, links, and interactivity we all take for granted today. “Many of the papers that had profound impact upon my development—to say nothing of the entire industry—are here,” raves Donald A. Norman, author of The Invisible Computer. In “an evocative whirlwind tour through 100 years of work” (Wired), Packer and Jordan bring together an “historically significant” (Slashdot) collection of the groundbreaking visions of scientists like Vannevar Bush, Douglas Englebart, and Norbert Wiener, and artists like John Cage, Nam June Paik, and William Gibson. Their insightful explanations of the core concepts behind multimedia provide historical context that “reads like a Western civ of modern media” (Film/Tape World). Book Website, commissioned by Intel Corporation.